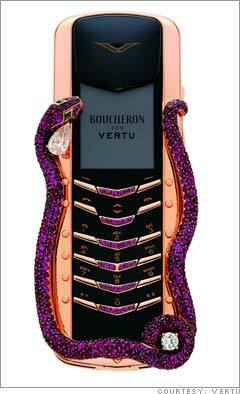 Vertu Cobra $310,000 Cellphone: Features Justify The Price? Work at Goldman Sachs and/or Morgan Stanley and have a couple extra hundred thousand/million dollars to spend? Then feast your eyes on the Vertu Signature Cobra. For a cool $310,000 you can purchase... a cellphone? Sure, the phone is decked out with precious gemstones (one pear-cut diamond, one round white diamond two emerald eyes and 439 rubies... I don't know what any of those things are, save for the rubies), but does it allow me to watch TV on-the-go? Can I message all those goth'd out hotties on MySpace with it? Can I pull up a Google Map of the local pub? I thought not. If this doesn't prove that we're in another gilded age then I don't know what will.